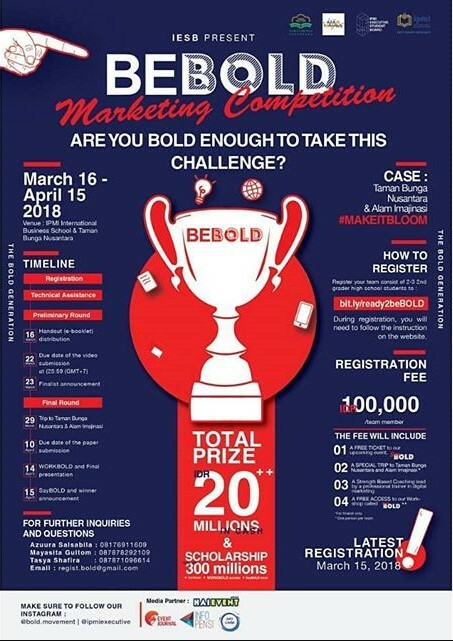 Lomba Marketing Competition BEBOLD 2018 IPMI International Business School | SMA Sederajat | Deadline 15 April 2018 | Lomba.co - Untuk kalian yang suka dengan lomba marketing competition, kenapa tidak melihat informasi lomba tersebut yang diselenggarakan oleh IPMI international business school ini kawan? tapi lomba ini ditujukan buat kalian yang masih sekolah SMA sederajat lho ya, apabila anda-anda tertarik coba buat team kalian dan lakukan pendaftaran supaya bisa mempersiapkan semuanya, untuk informasi lebih lanjut kalian semua dapat melihat dibawah ini. UPON BEING THE "KIDS JAMAN NOW"
As the millennials, we often heard the down-side of our generation. People say we are narcissists. Others see us as the "rules" or "tradition" breakers. They think what we do is strange or even crazy. Some might see us as being stubborn and incautious. But actually, we're just being CONFIDENT. We see the world from various perspectives and we love to find a better way of doing things because we are the INNOVATORS. We have a HIGH DETERMINATION and COURAGE. We see failure as a new opportunity. We hardly give up on our goals and we always find a way to achieve it. Also, we are brave enough to deal with risks in order to gain more return. In conclusion, we are the BOLD Generation. Love it or hate it, we'll keep moving forward. Let's prove the world that we are outstanding and impactful. IPMI International Business School challenge you to explore and expose the superb potential of Taman Bunga Nusantara as well as Alam Imajinasi and #MAKEITBLOOM! And for the best part, get the chance to WIN THE TOTAL PRIZE OF IDR 20++million CASH, SCHOLARSHIP total 300 million and many more! So, are you ready to be a part of the BOLD Movement? Belum ada Komentar untuk "Lomba Marketing Competition BEBOLD 2018 IPMI International Business School"